APJIS welcomes proposals for Special Issues that are designed not only to draw attention to new emerging topics in information systems (IS) but also to encourage insightful and influential research on topics that fall within the scope of the journal. Potential Guest Editors who would like to propose a Special Issue are invited to prepare a proposal and then submit it to the Editor-in-Chief through apjis@kmis.or.kr. Then, the Senior Editorial team will consider whether the proposal is of interest to the journal. When you submit a proposal, it needs to include at least the following: the title of the Special Issue, a brief CV of the proposed Guest Editors, a statement of the Special Issues significance for IS area, and an outline time schedule. Once the proposal is approved, the Guest Editors are expected to actively encourage submissions based on the Call for Papers. Being invited to submit a manuscript does not mean that publication is guaranteed. The review process by which Special Issue manuscripts are handled is nearly identical to that of regular submissions to APJIS. The Guest Editors make decisions at all stages of the reviewing process, up to the final acceptance decision, which is made by the Editor-in-Chief. The Guest Editors are expected to adhere to all APJIS guidelines, including the Statement of Editorial Policy, Code of Ethics, Instructions for Contributors, Guidelines for Reviewers and Style Guide. Submissions, which the Guest Editors find unsuited to the topic of the Special Issue, but still appropriate for APJIS in general, are transferred to the regular process, if necessary. Once sufficient papers have been accepted for publication, the Guest Editors and the Editor-in-Chief discuss and agree on the contents and order of the Special Issue. In addition, the Guest Editors are asked to prepare an editorial introduction and submit it with accepted papers to the Editor-in-Chief. The maximum length of a Special Issue is one issue of the Journal. However, a Special Issue may be smaller depending on the number of accepted manuscripts. Guest Editors are responsible for ensuring successful completion of the Special Issue. If you have any question, please contact the Editor-in-Chief through apjis@kmis.or.kr. The Asia Pacific Journal of Information Systems (APJIS), a peer-reviewed open-access journal, is seeking papers for the upcoming issues and special issues. 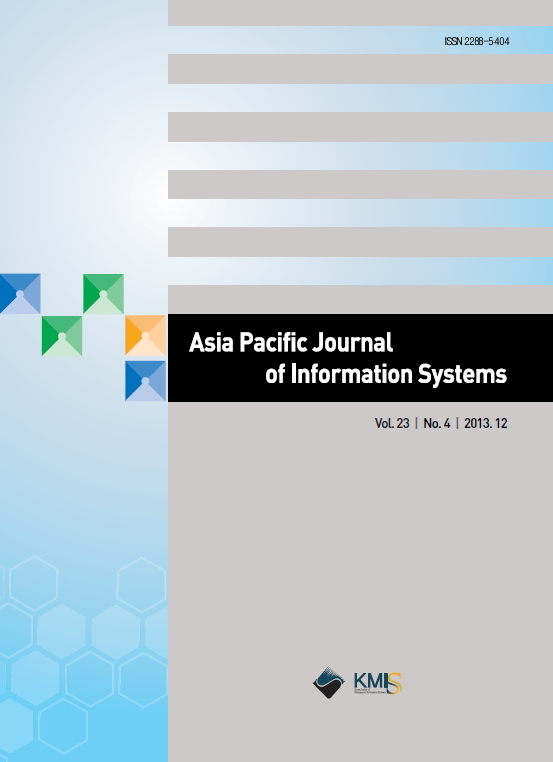 The Korea Society of Management Information Systems (KMIS) has been publishing the Asia Pacific Journal of Information Systems (APJIS)(ISSN: 2288-5404; e-ISSN: 2288-6818) since the year 1990 and has successfully made it a flagship journal in the information systems field in Korea. Open Access: Our journal is accessible online for free and has a larger audience. Full Peer Review: All manuscripts submitted to our journal undergo peer and double-blind review. No Submission and Publication Fees: No fee for all papers submitted to APJIS. Fast Review Cycle:The first review round will be completed within around one month. International Editorial Board: Well-known scholars of 37 editorial board and 10 advisory board members. "An Exploratory Study on the Cloud Computing Services: Issues and Suggestions for the Success"
was awarded as "Best Paper" at APJIS Vol.24 No.4 !!! The 2014 post-ICIS LG-CNS/KrAIS Workshop was held in Auckland, New Zealand on Dec 17, 2014. During the workshop, 28 papers were presented and 5 papers were invited to the paper development session. The workshop offered an opportunity to bring together Korean researchers and practitioners in IS field to meet and exchange ideas, recent research work, and future trends. Photos taken during the workshop were uploaded to the KrAIS website in facebook (www.facebook.com/groups/KrAIS). Please take a look at the website and leave your comment! Happy New Year!
" Dual Effect of Price in E-Commerce Environment: Focusing on Trust and Distrust Building Processes"
was awarded "Best Paper" at APJIS Vol.24 No.3 !!! In the past few years, business analytics has emerged as one of the most popular and important issues for both researchers and practitioners with an explosion of large-scale data such as social media data and real-time and historical data. Managers across all industries are looking for opportunities toincrease efficiencies and gain competitive advantage through the analysis of big data using a variety of quantitative techniques such as statistics, operations research methods, data mining, and social mining. We can clearly see that the possibilities of business analytics continue to evolve, driven by the recent advancement in knowledge management and business intelligence. The question that arisesis how to best capture the value by combining business analytics and knowledge management. Building on existing work in knowledge management and business intelligence, it is essential to identify how businessanalytics can be used to address many of the issues currently facing knowledge management in both academia and industrial sectors. This special issue aims to bring together scholars who investigate organizational performance and sustainable competitive advantage in the domains of knowledge management, business intelligence, business analytics, and big data. It aims to draw together empirically-grounded and theoretically-informed analyses of the key issues in contemporary forms of knowledge management and business analytics from across various fields and methodologies. Applied research in these areas is also welcome. (h2choi@kookmin.ac.kr / kunsoo.han@mcgill.ca / afzcheng@polyu.edu.hk). As we already announced, you are asked to submit your research proposals to APJIS (apjis@kmis.or.kr). If your proposal is selected, you can collect data for your research for free, which is supported by Macromillembrain Co.(www.embrain.com). The schedule of proposal selection process is as follows. If you have any questions, please contact APJIS through apjis@kmis.or.kr. Hope to have your strong participation! Thank you.